Dr Joanna Collingwood, from Warwick's School of Engineering, was part of a research team which characterised iron species associated with the formation of amyloid protein plaques in the human brain – abnormal clusters of proteins in the brain. The formation of these plaques is associated with toxicity which causes cell and tissue death, leading to mental deterioration in Alzheimer's patients. They found that in brains affected by Alzheimer's, several chemically-reduced iron species including a proliferation of a magnetic iron oxide called magnetite – which is not commonly found in the human brain – occur in the amyloid protein plaques. The team had previously shown that these minerals can form when iron and the amyloid protein interact with each other. Thanks to advanced measurement capabilities at synchrotron X-ray facilities in the UK and USA, including the Diamond Light Source I08 beamline in Oxfordshire, the team has now shown detailed evidence that these processes took place in the brains of individuals who had Alzheimer's disease. They also made unique observations about the forms of calcium minerals present in the amyloid plaques. "Iron is an essential element in the brain, so it is critical to understand how its management is affected in Alzheimer's disease. The advanced X-ray techniques that we used in this study have delivered a step-change in the level of information that we can obtain about iron chemistry in the amyloid plaques. We are excited to have these new insights into how amyloid plaque formation influences iron chemistry in the human brain, as our findings coincide with efforts by others to treat Alzheimer's disease with iron-modifying drugs." The team, led by an EPSRC-funded collaboration between University of Warwick and Keele University – and which includes researchers from University of Florida and The University of Texas at San Antonio – made their discovery by extracting amyloid plaque cores from two deceased patients who had a formal diagnosis of Alzheimer's. The researchers scanned the plaque cores using state-of-the-art X-ray microscopy at the Advanced Light Source in Berkeley, USA and at beamline I08 at the Diamond Light Source synchrotron in Oxfordshire, to determine the chemical properties of the minerals within them. They also analysed the magnetic state of the iron species in the plaques to confirm the presence of various iron minerals including the magnetic iron oxide magnetite. The research team propose that interactions between iron and amyloid that produce the chemically reduced iron species, including magnetite, may account for toxicity that contributes to the development and progression of Alzheimer's. There are 850,000 people with dementia in the UK, with numbers set to rise to over 1 million by 2025. This will soar to 2 million by 2051. There is no cure for Alzheimer's disease or any other type of dementia. Delaying the onset of dementia by five years would halve the number of deaths from the condition, saving 30,000 lives a year. 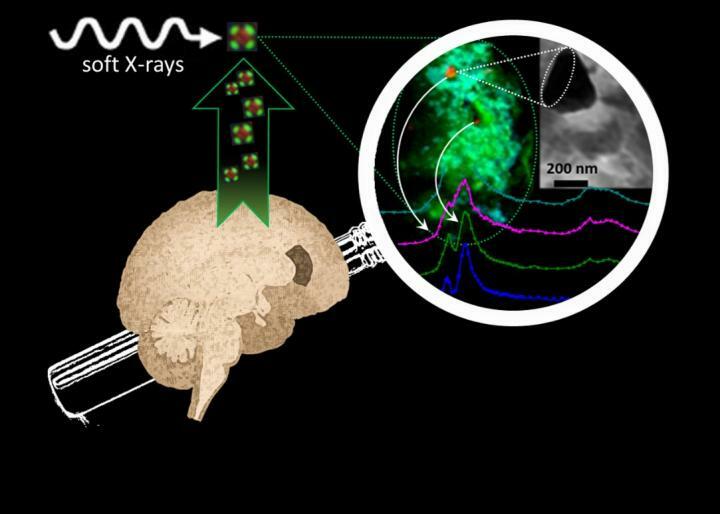 The research, 'Nanoscale synchrotron X-ray speciation of iron and calcium compounds in amyloid plaque cores from Alzheimer's disease subjects', is published in Nanoscale. Read paper here. It is authored by James Everett, Joanna F. Collingwood, Vindy Tjendana-Tjhin, Jake Brooks, Frederik Lermyte, Germán Plascencia-Villa, Ian Hands-Portman, Jon Dobson, George Perry and Neil D. Telling. This work was supported by EPSRC grants EP/K035193/1 (JFC), EP/N033191/1-EP/N033140/1 (JFC-NDT), the Alzheimer's Association (AARFD-17-529742), University of Warwick alumni donations (VTT, JE), the RCMI Program from NIH at UTSA (5G12RR013646, G12MD007591), San Antonio Life Sciences Institute (SALSI)-Clusters in Research Excellence Program, and Semmes Foundation. The University of Warwick's School of Engineering is one of the leading unified engineering schools in the UK. The department's research was ranked third in the Research Excellence Framework 2014 for General Engineering.